Darren C. Demaree's contributes to this month's issue of "Crack the Spine Literary Magazine". Pick up a copy today. 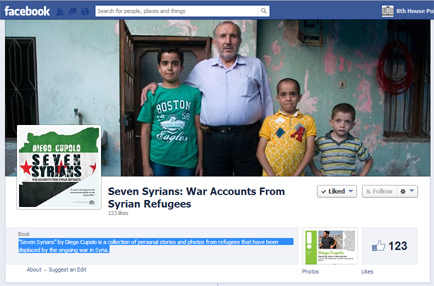 "Seven Syrians" by Diego Cupolo: The Facebook Page. "Seven Syrians" by Diego Cupolo, a collection of personal stories and photos from refugees that have been displaced by the ongoing war in Syria, now has its facebook page. Like it, follow it and keep abreast of developments. Six Emily Poems by Darren C. Demaree featured in CONSTRUCTION MAGAZINE. The latest issue of Construction Magazine features six poems by Darren C. Demaree, taken from his latest collection "As We Refer to our Bodies". Read the article here. 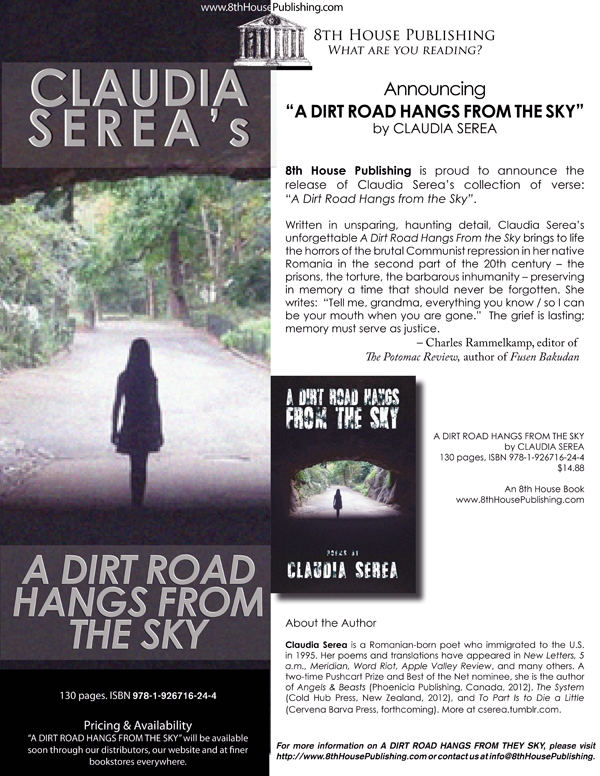 8th House Publishing is pleased to announce the a book signing event of A Dirt Road Hangs From the Sky by Claudia Serea. Meet the author and get your signed copy! CLAUDIA SEREA will be reading at Cornelia Street Café on Thursday, February 27, 2014, at 6 p.m, to celebrate the New York launch of her poetry book "A Dirt Road Hangs From the Sky"
Written in unsparing, haunting detail, Claudia Serea’s unforgettable A Dirt Road Hangs From the Sky brings to life the horrors of the brutal communist repression in her native Romania in the second part of the 20th century – the prisons, the torture, the barbarous inhumanity— preserving in memory a time that should never be forgotten. She writes: “Tell me, grandma, everything you know / so I can be your mouth when you are gone.” The grief is lasting; memory must serve as justice. Friday, January 24, 2014, 7 p.m. There will be music, good friends, good poetry, great atmosphere! An open mic with generous reading time follows. $6 cover includes coffee/tea and dessert. Read an excerpt of Diego Cupolo's "Seven Syrians" in this month's Canadian Dimension Magazine. Excerpts of Diego Cupolo's "SEVEN SYRIANS"in this month's Canadian Dimension Magazine. Read it here and reserve your copy today! See the Launch event here. 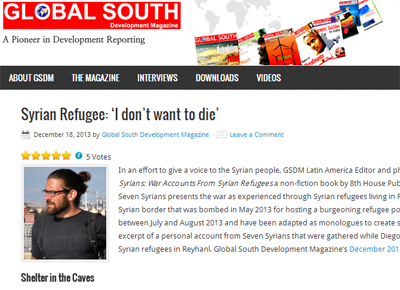 Diego Cupolo's "Seven Syrians" featured in this month's issue of Global South. See the article on line here. Stay tuned for the upcoming launch and reserve your copy today! 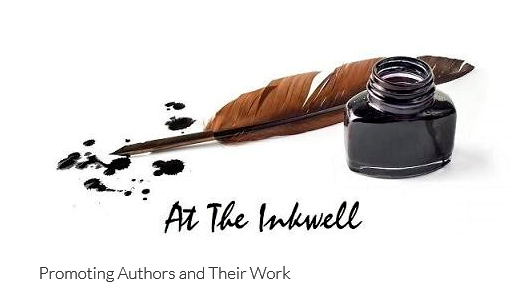 Claudia Serea featured on "At the Inkwell"
The latest issue of "At the Inkwell" features Claudia Serea in an article, "How a Romanian poet reconciled her identity in a new language" Read it here. Stay tuned for Claudia upcoming readings in New York and New Jersey. See her latest release, "A Dirt Road Hangs From the Sky" here. 8th House Publishing is proud to announce the publication of Seven Syrians: War Accounts from Syrian Refugees by Diego Cupolo. A book launch will be held in association with A Heart for Syria at Café Matina, on January 25, 2014, 6-9pm. in Montreal, Canada. Proceeds will go to helping provide humanitarian aid to Syrian Refugees. 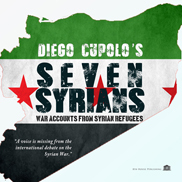 SEVEN SYRIANS: War Accounts from Syrian Refugees by Diego Cupolo 86 pages; $18.88. January 2014. Full-Color. A HEART FOR SYRIA a charity organization supplying humanitarian aid to Syrians displaced by the ongoing war. At least twice a month, a container-load of clothing, blankets and medical supplies leave the port of Montreal to help civilians inside Syria. Find out more on how you can help here. A glowing review of "As We Refer to Our Bodies"
Domenica Martinello of Concordia University's Soliloquies reviews Darren C. Demaree's "As We Refer to our Bodies". Read the review here. 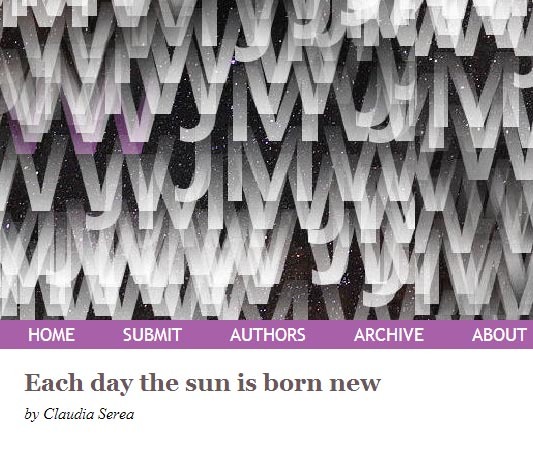 Announcing CLAUDIA SEREA's "A Dirt Road Hangs From the Sky"
8th House Publishing is pleased to announce the publication of A Dirt Road Hangs From the Sky by Claudia Serea, a two-time Puschart Prize and Best of the Net nominee. Available December 2nd. 2013. Reserve your copy today! Rutherford, NJ, on January 24. New York, NY, Cornelia Street Cafe on February 27. New York, NY, March 12, KGB Bar in NY. 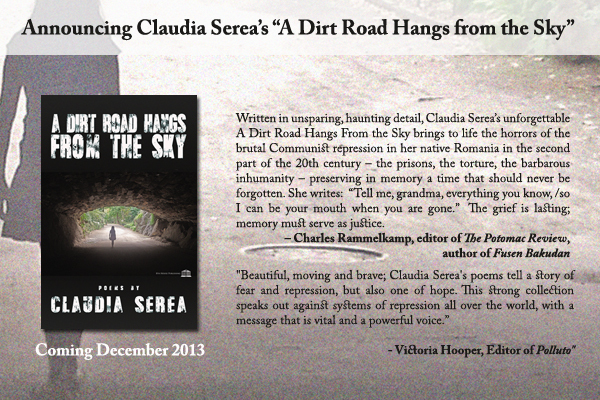 Claudia Serea's "A Dirt Road Hangs from the Sky"
Claudia Serea's "A Dirt Road Hangs from the Sky" coming soon. Look for it this December. As We Refer to our Bodies now on Sale!